In Part Two we looked at one paper by Lorenz from 1968 where he put forward the theory that climate might be “intransitive”. In common parlance we could write this as “climate might be chaotic” (even though there is a slight but important difference between the two definitions). In this article we will have a bit of a look at the history of the history of climate – that is, a couple of old papers about ice ages. These papers are quite dated and lots of new information has since come to light, and of course thousands of papers have since been written about the ice ages. So why a couple of old papers? It helps to create some context around the problem. These are “oft-cited”, or seminal, papers, and understanding ice ages is so complex that it is probably easiest to set out an older view as some kind of perspective. At the very least, it helps get my thinking into order. Whenever I try to understand a climate problem I usually end up trying to understand some of the earlier oft-cited papers because most later papers rely on that context without necessarily repeating it. Variations in the Earth’s Orbit: Pacemaker of the Ice Ages by JD Hays, J Imbrie, NJ Shackleton (1976) is referenced by many more recent papers that I’ve read – and, according to Google Scholar, cited by 2,656 other papers – that’s a lot in climate science. For more than a century the cause of fluctuations in the Pleistocene ice sheets has remained an intriguing and unsolved scientific mystery. Interest in this problem has generated a number of possible explanations. One group of theories invokes factors external to the climate system, including variations in the output of the sun, or the amount of solar energy reaching the earth caused by changing concentrations of interstellar dust; the seasonal and latitudinal distribution of incoming radiation caused by changes in the earth’s orbital geometry; the volcanic dust content of the atmosphere; and the earth’s magnetic field. Other theories are based on internal elements of the system believed to have response times sufficiently long to yield fluctuations in the range 10,000 to 1,000,000 years. Such features include the growth and decay of ice sheets, the surging of the Antarctic ice sheet; the ice cover of the Arctic Ocean; the distribution of carbon dioxide between atmosphere and ocean; and the deep circulation of the ocean. Additionally, it has been argued that as an almost intransitive system, climate could alternate between different states on an appropriate time scale without the intervention of any external stimulus or internal time constant. This last idea is referenced as Lorenz 1968, the paper we reviewed in Part Two. The first [problem] is the uncertainty in identifying which aspects of the radiation budget are critical to climate change. Depending on the latitude and season considered most significant, grossly different climate records can be predicted from the same astronomical data..
Milankovitch followed Koppen and Wegener’s view that the distribution of summer insolation at 65°N should be critical to the growth and decay of ice sheets.. Kukla pointed out weaknesses.. and suggested that the critical time may be Sep and Oct in both hemispheres.. As a result, dates estimated for the last interglacial on the basis of these curves have ranged from 80,000 to 180,000 years ago. The second and more critical problem in testing the orbital theory has been the uncertainty of geological chronology. Until recently, the inaccuracy of dating methods limited the interval over which a meaningful test could be made to the last 150,000 years. This paper then draws on some newer, better quality data for the last few hundred thousand years of temperature history. By the way, Hays was (and is) a Professor of Geology, Imbrie was (and is) a Professor of Oceanography and Shackleton was at the time in Quarternary Research, later a professor in the field. The first, eccentricity, is the only one that changes the total amount of solar insolation received at top of atmosphere in a given year. Note that a constant solar insolation at the top of atmosphere can be a varying solar absorbed radiation if more or less of that solar radiation happens to be reflected off, say, ice sheets, due to, say, obliquity. The second, obliquity, or tilt, affects the difference between summer and winter TOA insolation. So it affects seasons and, specifically, the strength of seasons. The third, precession, affects the amount of radiation received at different times of the year (moderated by item 1, eccentricity). So if the earth’s orbit was a perfect circle this parameter would disappear. When the earth is closest to the sun in June/July the Northern Hemisphere summer is stronger and the SH summer is weaker, and vice versa for winters. So eccentricity affects total TOA insolation, while obliquity and precession change its distribution in season and latitude. However, variations in solar insolation at TOA depend on e² and so the total variation in TOA radiation has, over a very long period, only been only 0.1%. This variation is very small and yet the strongest “orbital signal” in the ice age record is that of eccentricity. A problem, that even for the proponents of this theory, has not yet been solved. Our geological data comprise measurements of three climatically sensitive parameters in two deep-sea sediment cores. These cores were taken from an area where previous work shows that sediment is accumulating fast enough to preserve information at the frequencies of interest. Measurements of one variable, the per mil enrichment of oxygen 18 (δ18O), make it possible to correlate these records with others throughout the world, and to establish that the sediment studied accumulated without significant hiatuses and at rates which show no major fluctuations..
.. From several hundred cores studied stratigraphically by the CLIMAP project, we selected two whose location and properties make them ideal for testing the orbital hypothesis. Most important, they contain together a climatic record that is continuous, long enough to be statistically useful (450,000 years) and characterized by accumulation rates fast enough (>3 cm per 1,000 years) to resolve climatic fluctuations with periods well below 20,000 years. The cores were located in the Southern Indian ocean. What is interesting about the cores is that 3 different mechanisms are captured from each location, including δ18O isotopes which should be a measure of ice sheets globally and temperature in the ocean at the location of the cores. There is much discussion about the dating of the cores. In essence, other information allows a few transitions to be dated, while the working assumption is that within these transitions the sediment accumulation is at a constant rate. Although uniform sedimentation is an ideal which is unlikely to prevail precisely anywhere, the fact that the characteristics of the oxygen isotope record are present throughout the cores suggests that there can be no substantial lacunae, while the striking resemblance to records from distant areas shows that there can be no gross distortion of accumulation rate. The key part of their analysis is a spectral analysis of the data, compared with a spectral analysis of the “astronomical forcing”. .. we postulate a single, radiation-climate system which transforms orbital inputs into climatic outputs. We can therefore avoid the obligation of identifying the physical mechanism of climatic response and specify the behavior of the system only in general terms. The dynamics of our model are fixed by assuming that the system is a time-invariant, linear system – that is, that its behavior in the time domain can be described by a linear differential equation with constant coefficients. The response of such a system in the frequency domain is well known: frequencies in the output match those of the input, but their amplitudes are modulated at different frequencies according to a gain function. Therefore, whatever frequencies characterize the orbital signals, we will expect to find them emphasized in paleoclimatic spectra (except for frequencies so high they would be greatly attenuated by the time constants of response)..
My translation – let’s compare the orbital spectrum with the historical spectrum without trying to formulate a theory and see how the two spectra compare. We have also calculated spectra for two time series recording variations in insolation [their fig 4 – our fig 2], one for 55°S and the other for 60°N. To the nearest 1,000 years, the three dominant cycles in these spectra (41,000, 23,000 and 19,000 years) correspond to those observed in the spectra for obliquity and precession. This result, although expected, underscores two important points. 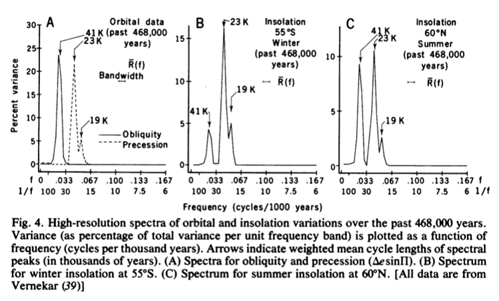 First, insolation spectra are characterized by frequencies reflecting obliquity and precession, but not eccentricity. Second, the relative importance of the insolation components due to obliquity and precession varies with latitude and season. Nevertheless, five of the six spectra calculated are characterized by three discrete peaks, which occupy the same parts of the frequency range in each spectrum. Those correspond to periods from 87,000 to 119,000 years are labeled a; 37,000 to 47,000 years b; and 21,000 to 24,000 years c. This suggest that the b and c peaks represent a response to obliquity and precession variation, respectively. Note that the major cycle shown in the frequency spectrum is the 100,000 peak. There is a lot of discussion in their paper of the data analysis, please have a read of their paper to learn more. The detail probably isn’t so important for current understanding. Over the frequency range 10,000 to 100,000 cycle per year, climatic variance of these records is concentrated in three discrete spectral peaks at periods of 23,000, 42,000, and approximately 100,000 years. These peaks correspond to the dominant periods of the earth’s solar orbit and contain respectively about 10, 25 and 50% of the climatic variance. The 42,000-year climatic component has the same period as variations in the obliquity of the earth’s axis and retains a constant phase relationship with it. The 23,000-year portion of the variance displays the same periods (about 23,000 and 19,000 years) as the quasi-periodic precession index. It is concluded that changes in the earth’s orbital geometry are the fundamental cause of the succession of Quarternary ice ages. 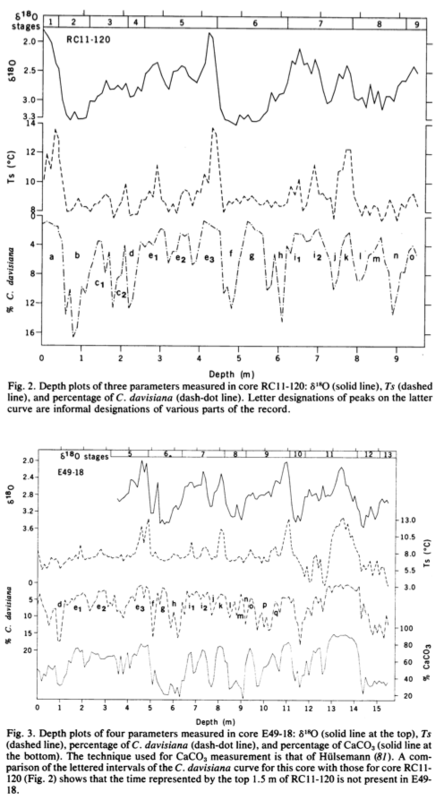 Things were looking good for explanations of the ice ages in 1975..
For those who want to understand more recent evaluation of the spectral analysis of temperature history vs orbital forcing, check out papers by Carl Wunsch from 2003, 2004 and 2005, e.g. The spectral description of climate change including the 100 ky energy, Climate Dynamics (2003). Do changes in orbital geometry cause changes in climate that are geologically detectable? On the one hand, climatologists have attacked the problem theoretically by adjusting the boundary conditions of energy-balance models, and then observing the magnitude of the calculated response. If these numerical experiments are viewed narrowly as a test of the astronomical theory, they are open to question because the models used contain untested parameterizations of important physical processes. Work with early models suggested that the climatic response to orbital changes was too small to account for the succession of Pleistocene ice ages. But experiments with a new generation of models suggest that orbital variations are sufficient to account for major changes in the size of Northern Hemisphere ice sheets.. ..In 1968, Broecker et al. (34, 35) pointed out that the curve for summertime irradiation at 45°N was a much better match to the paleoclimatic records of the past 150,000 years than the curve for 65°N chosen by Milankovitch..
Current Status. This is not to say that all important questions have been answered. In fact, one purpose of this article is to contribute to the solution of one of the remaining major problems: the origin and history of the 100,000-year climatic cycle. At least over the past 600,000 years, almost all climatic records are dominated by variance components in a narrow frequency band centered near a 100,000-year cycle. Yet a climatic response at these frequencies is not predicted by the Milankovitch version of the astronomical theory – or any other version that involves a linear response..
..Another problem is that most published climatic records that are more than 600,000 years old do not exhibit a strong 100,000-year cycle.. The goal of our modeling effort has been to simulate the climatic response to orbital variations over the past 500,000 years. The resulting model fails to simulate four important aspects of this record. It fails to produce sufficient 100k power; it produces too much 23k and 19k power; it produces too much 413k power; and it loses its match with the record around the time of the last 413k eccentricity minimum, when values of e [eccentricity] were low and the amplitude of the 100k eccentricity cycle was much reduced.. ..The existence of an unstable fixed point makes tuning an extremely sensitive task. For example, Weertman notes that changing the value of one parameter by less than 1 percent of its physically allowed range made the difference between a glacial regime and an interglacial regime in one portion of an experimental run while leaving the rest virtually unchanged.. This would be a good example of Lorenz’s concept of an almost intransitive system (one whose characteristics over long but finite intervals of time depend strongly on initial conditions). Once again the spectre of the Eminent Lorenz is raised. We will see in later articles that with much more sophisticated models it is not easy to create an ice-age, or to turn an ice-age into an inter-glacial. I’m glad to see that you have stopped pondering all that rubbish about “greenhouse gases”, and are now looking into climate science. That is, the question of what the climate’s history looks like, and what may have caused that history. As to the ideas described in this posting, I will point out that the interest in linear models is not due to any evidence that climatic processes are, in fact, linear. It is because we understand linear systems, and we are fairly certain that the orbital mechanics of the solar system is highly regular, so, if the system is assumed linear, we have a pretty good idea how it should respond to orbital mechanics. This is a typical case of having no idea where you dropped the keys, but looking for them under the streetlight, because the light’s better there. It seems likely to me that we will not understand the causes of glaciation any time soon, even assuming that there are identifiable causes. What, then, can we say, that is worth saying? This; the history of the last few million years shows a pattern of oscillating glaciations, in which much of the northern Hemisphere was covered in glaciers far more often than not. Further, the interglacials, the periods when the ice retreated, ended quite abruptly, and the current interglacial has lasted longer than average. Unless something critical has changed quite recently, the obvious prediction is that the glaciers will be back pretty soon. I won’t see them, but my grandchildren might. Of course, the return of the glaciers would be deeply problematic for humans. There is good reason to suppose that our current population density could not be maintained during a glaciation. And the transition to a smaller population would probably not be orderly and polite. Is it possible that something has changed, or can be changed, to prevent this catastrophe? Maybe if we dig up a lot of petroleum and coal, and burn it, do you think perhaps the increase in CO2 will prevent the formation of mile-thick masses of ice over what is currently highly productive farm land? It seems rather a long shot, given the shaky underpinnings of “greenhouse theory”. But I suppose it’s worth a try if nothing better is at hand. Is there any way to pay for such a gargantuan effort? [Retrieved from the spam queue on Oct 13th].I’ve been accused of perseverating on the most elementary physics . That’s because to me , being able to calculate something is a necessary condition for me to claim to understand it . So far that’s limited to just calculating the equilibrium temperature of a colored ball in our orbit in a handful of one line definitions in APL . But even those non-optional computations which must be matched by any more elaborate implementation raise significant discrepancies with observations which must be reconciled . One observation which comes out of this back to the very basics computational approach is noting that our distance from the sun varies from 1.520977e+011 to 1.4709807e+011 meters from aphelion to perihelion , a ratio of about 3.3% . Given the most fundamental relationship that temperature is proportional to the square root of distance from the sun , that implies a variation of about 1.7% in equilibrium temperature between ap- and peri- -helion ., 5 times the 0.3% variation in temperature since the invention of the steam engine . Since we know both the phase and the amplitude of the “forcing” ( I hate that damn word ) surely , if we are to explain that 0.3% effect we should be able to detect that ap- versus peri- effect . One cycle which undoubtedly effects mean temperature , given earth’s latitudinal asymmetry , is the phase of polar orientation versus orbital distance . Can anybody point me to the length of that cycle ? SOD: Your conventional explanation ASSUMES that the effects of orbital forcing on glaciation are felt almost immediately. For D and O18 proxies that report on the volume of water present in continental ice sheets, this assumption is likely to be incorrect, but it is a sensible assumption for proxies that report on surface temperature. When it gets colder, seasonal snowfall no longer melts and the local albedo increases. Under these circumstances, ice sheets will continue to build up at a fairly steady rate as long as the cold period persists. (The rate of buildup could even accelerate: As these ice sheets increase in height, the surface temperature drops about 1 degC for every 150 m due to that lapse rate.) Eventually, the ice sheet will grow so high that the rate of accumulation will be equal to the rate at which ice flows into the ocean, but it isn’t clear that the major continental ice sheets (except Antarctica) ever grew big enough for this to happen. In that case, the CHANGE in the volume of ice (which is what isotope proxies respond to) will depend on temperature. In that case, we would want to look at the relationship between the derivative of the isotope proxy and the forcing. Fortunately, for purely sinusoidal responses, the frequency spectrum will have the same peaks as the forcings, but the forcing and response will actually be 90 degrees out of phase. This problem has been discussed in the blogosphere and I believe it has been published. A perfect example is annual cycle of the Arctic Ice Sheet. The peak of insolation is at the beginning of summer, but the minimum in ice volume occurs at the beginning of fall. For conventional climate change, forcings are measured in units of power – usually per unit area – and temperature is proportional to energy – with heat capacity, depth of the “mixed layer” entering into the relationship. Unless you can be sure the temperature or other response has come into equilibrium with the forcing, you need to integrate the forcing or take the derivative of the response before analyzing the relationship between forcing and temperature. For ice ages and Arctic sea ice today, energy also goes into melting or freezing water, not changing the temperature. It’s the melting rate that correlates with insolation with much less lag, not the extent/area/volume itself. It’s not at all surprising that the minimum extent is shifted to near the autumnal equinox because that’s when melting stops, more or less, and freezing starts. That correlates with the maximum rate of decrease of insolation, more or less. For the NSIDC average extent from 1979-2000, the maximum smoothed rate of loss is on day 211. The summer solstice is about day 172. The rate of change of ice volume has been shown to correlate well with insolation at 65N over the last few million years or so, except for glacial/interglacial transitions when the loss in volume is much higher than the change in insolation. I need to massage the PIOMAS data, but I suspect that the date of maximum reduction in volume on average is even earlier than day 211. So, as you pointed out and I missed on the first read, you do have to take the derivative of the forcing or the response. I suspect you meant to say integrate the forcing or take the derivative of the response. I checked the PIOMAS data and the maximum rate of volume loss of Arctic sea ice is about ten days after the summer solstice. SOD: Would you consider posting Figures 1 and 2 from the Roe paper mentioned by DeWitt (or discussing the Roe paper)? There have been mathematical models before Roe’s paper based on equations where the change in ice volume depended on isolation, but climate scientists continued showing the correlation between insolation and ice volume rather than insolation and the change in ice volume. 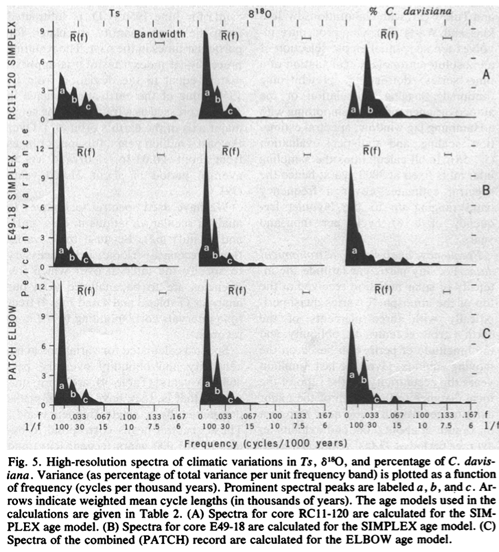 (See this 1980 Science paper, but Roe may have been first to show how much better the correlation is with the derivative. I’m not sure why climate scientists cling to the conventional correlation, when the correlation with the derivative makes much more mechanistic sense (to me at least). And yes, I expect to discuss this paper, it is one of the ones in my list to cover. I think not only the eccentricity, also the change of obliquity should change the total amount of solar insolation received at top of atmosphere. This is due the flattening of the earth which changes the cross section. The equatorial radius is 6378137 m but the polar radius is only 6356752 m. Neglecting the atmosphere the ellipse that block the sunlight is 6378 x 6357 km if the sun is above the equator but 6378 x 6378 km in the (hypothetical) case if the sun is above the pole. The difference between these extrem cases is 0.34%. Taking your two radii, which match those in Wikipedia, and assuming a linear change with angle between these two extremes (because the exact spherical geometry seems like a lot of work).. So we get 0.0037% change per degree of obliquity, or 0.009% for the obliquity change experienced by the earth. This is over a 41,000 year cycle, so min-max in half the cycle equates to 0.009% over 20,000 years..
.. or 0.2 mW/m2 per century. Compare with the calculation in Part Four of 0.8 mW/m2 per century due to eccentricity. The rate of change of insolation received due to the changing “blocking” radius of the earth due to obliquity changes is about 1/4 of the rate of change of the insolation received due to the negligible eccentricity effect. where phi is the angle between sun and equator plane, R_e und R_p are the equatorial and polar radius. Have you already took into account that the sun position crosses the equator two times the year? So phi goes from -ε to +ε and back? The sun crosses the equator twice a year = seasons. The variation of obliquity on much longer time scales is something that affects the strength of seasons. The effect is small as already stated by SoD. Whether is small enough to be ignored is another matter.